The overall LEADS change model. Each LEADS domain and the four capabilities within each domain. The contribution each of the LEADS domains makes to the change model. Begin to develop a plan to lead a change in health systems. Identify examples from across Canada that might be used as exemplars for the LEADS capabilities. Find additional resources (e.g., booklet bibliographies). Provide valuable curriculum and course materials. You will need to print the form, scan it and email it to orders@leadscanada.net. At present there is no online payment option. You may include your credit card information on the form, or if you would prefer not to email this information, a LEADS representative will contact you by telephone to make payment arrangements. Please include a daytime telephone number on the form. PLEASE NOTE: Hard copy books are shipped from the CCHL Ottawa office via courier. Shipping charges will apply Shipping charges may exceed $35 depending upon weight and shipping distance from Ottawa. 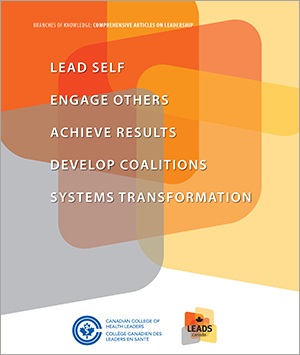 Develop your leadership wisdom with this practical resource book, applications and systems that is aligned with the LEADS in a Caring Environment capabilities framework. Please go to LEADS Services to find out more about what the Collaborative has to offer.